Treviglas College hosted a modern languages masterclass attended by pupils in key stage 2 in partner primary schools. 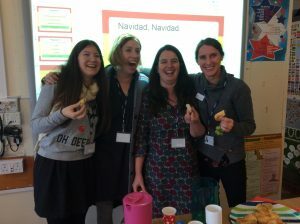 Cornwall SCITT MFL trainee teachers at the end of their first term of training led the French and Spanish masterclasses, assisted by language leaders from Treviglas and Mrs Gilbert, joint leader of learning for MFL. The pupils learned about Christmas celebrations in France and Spain, and deepened their cultural knowledge through exploring traditional songs, foods, games and stories. The children enjoyed taking part in a treasure hunt to help them with learning the new vocabulary. They learnt traditional Christmas songs in French and Spanish, and each language group performed to the other. Two of the trainee teachers are French native speakers, so this added an exciting dimension to the morning. I learned how the Spanish celebrate Christmas and what foods they eat.